Print over the Internet/Intranet to your home or office networked printer! 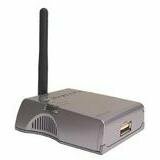 The Hawking HWPS1UG Wireless USB Print Server is a powerful and convenient tool to connect your USB printers to your existing wireless 802.11b or 802.11g wireless network. Through its enhanced functionality, the HWPS1UG can support a USB printer on either a wired or wireless 802.11b or 802.11g network. The Hawking HWPS1UG combined with the Internet Printing Protocol (IPP) lets you easily connect to any printer and print documents by specifying the print server's IP address. With IPP technology, printing over a WAN or the Internet becomes much easier. You can send a print job to a printer in another country just as easily as sending a print job to your home or office printer. IPP eliminates the need for fax communications between offices. Simply print an original document through the HWPS1UG's IPP capabilities and send it from one office to another. The print quality from IPP printing is equal to that of a document printed from your local office. With the HWPS1UG , your printer become a fully functional networked print station! Wireless Freedom, order today!